Recently I had the good fortune to attend Heidi Swapp’s “Make Pretty Stuff Down Under” Workshop in Perth with my lovely friend, Marion. It was a great workshop! We learnt new techniques and had the opportunity to play with lots of Heidi’s products including her colour sprays and one of her memory files. 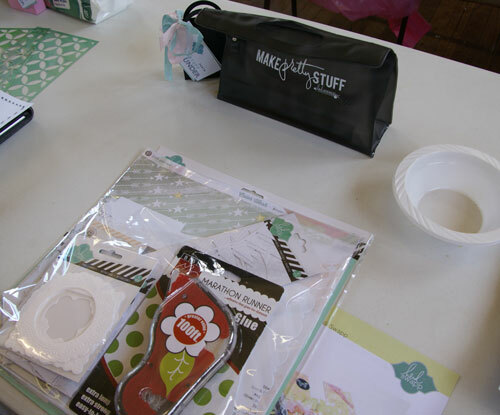 We also received three very generous workshop kits and I now have lots of lovely Heidi products to play with. Here’s a pic of the first kit and there were four colour sprays to keep in the “Make Pretty Stuff” bag. Experimenting with all those wonderful products was heaps of fun but the most important lesson I learnt was the importance of telling the story behind the photos. Heidi and Kim (who ran one of the workshops) both shared very moving stories with us that highlighted the importance of journaling. One of the things Heidi spoke about was how we remember or focus on the few negative things that happen while forgetting the hundreds of wonderful things that occur in our lives every day. Recently, I was looking at one of the very first scrapbook pages I had made. I had added some journaling to the page and the story was something I had completely forgotten. This confirmed for me how important it is to record our stories before they are gone forever. With 2013 ending and the New Year just around the corner it is the time to make resolutions for the coming year. I think one of mine will be to record those important stories – whether it be on my scrapbook pages, in a journal or in some other way. Thanks for this timely reminder, Lorraine. Yesterday we had a look at an album of old photos and we were already having trouble working out who they were. I must work on a few of my older photos this holidays. A lovely reminder to not only capture the moment but the story behind the picture.